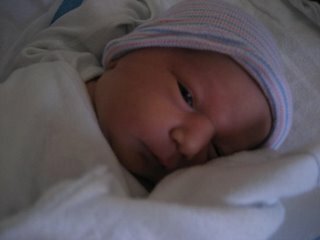 So, Stephanie's sister-in-law had a baby a couple of days ago, and she's doing just fine. Her name is Phoebe. Her middle name yet to be determined, and we are lobbying for Otter! Mike and Alison, the proud parents (you faithful readers have already met Alison, the all hailed QUEEN OF PAINT), had been stingy about deciding the name. The betting pool before the birth had narrowed down to either Phoebe or Audrey. 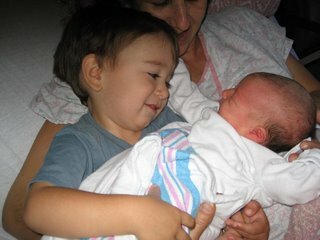 Benjamin, Phoebe's two year old brother, and a darned smart kid, was asked on the day of the birth what his new sister's name should be. With a wisdom far beyond his years, he answered quickly, decisively, and creatively, "Sea Otter." PHOTO BELOW OF THE BEAUTIFUL BABY PHOEBE. SHE LOOKS LIKE SHE COULD SWIM QUITE GRACEFULLY, DON'T YOU THINK? 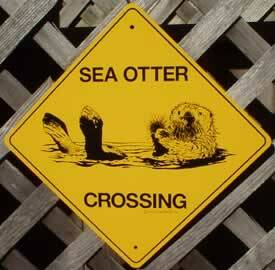 And so, our grass-roots candidacy for otter has begun. What better name could there be? And not only that, but they live in California, home of Moon Unit, Dweezil, Kobe, and other names not so typical-- Otter would be a perfect complement to this beaming young boy's creativity and love for his day-old sister. If you agree, please comment here. We will forward all of your comments to the parents, who will be no doubt heartened by your grassroots swelling of support. Comments on "In Which, our new niece is a Sea Mammal"
Adam isn't so good with the details: 7 lbs 2 oz, 19" long, born 4/12/07 in Los Angeles. i like the name "otter". my grandmother's maiden name was udder. she was dutch and ironically loved sea otters. i think it would be a cute nickname. Phoebe Otter actually has a beautiful ring to it! And speaking of otters...check this video out which proves these are the cutest animals ever, and your niece would be lucky to be named "otter"!